Fred was born in Dublin to Arthur Halliday, a businessman, and his wife Rita (nee Finigan). He was educated at the Marist school in Dundalk before going to Ampleforth college in Yorkshire. He graduated from Queen’s College, Oxford, in 1967 with a degree in philosophy, politics and economics, then went to the School of Oriental and African Studies (Soas) in London. Fred established wide connections with, among others, Arab and Iranian intellectuals and activists, and travelled widely in the region. From these encounters and researches came his book Iran: Dictatorship and Development, in 1978, which aroused great interest as it anticipated Iran’s revolution the following year, though he did not foresee the Islamic bent of the revolution, which was not the result of a long established Islamic movement, but the outcome of particular events, including the rise of Khomeini. Further travel and research took Fred, with Maxine Molyneux, to Ethiopia and Yemen in 1977 and 1978, resulting in a jointly authored book, The Ethiopian Revolution (1981), tracing the conditions and causes of the 1974 revolution. He married Maxine in 1979. Fred’s interest in Soviet policy and the cold war, and his critical stance on US intervention in Afghanistan, were recurrent themes in his writing, evident in Cold War, Third World: Essays On Soviet-American Relations in the 1980s, published in 1989. It was not until 1983 that Fred formally entered academia with an appointment to a lectureship at LSE. He obtained his PhD from LSE in 1985, with a thesis on the Democratic Republic of Yemen. At LSE, Fred continued to write prolifically, now concentrating on international relations, with fresh and critical treatment of theories in that field. His interest in the Middle East acquired a more immediate and topical aspect with the rise of Islamic politics, Afghanistan and 9/11, about which he wrote Two Hours That Shook the World (2001). His interest in Muslim communities in Britain and Europe had begun with his earlier study of the Yemeni community in Sheffield, Arabs in Exile: Yemeni Migrants in Urban Britain (1992). His contribution to the debates on Muslims in the west came in some of the essays in his highly influential Islam and the Myth of Confrontation (1996), with his characteristically incisive arguments against the prevalent ideas of a “clash of civilisations” and the “otherness” of Muslims and their politics. Fred was elected to the British Academy in 2002. In 2008 he left the LSE to take up a position as research professor at the Barcelona Institute of International Studies. Fred loved Barcelona, where he was part of a lively social and intellectual network. He was a great teacher and mentor, and numerous students and young colleagues acknowledge their debt to his supervision, mentoring and inspiration. His lectures, both academic and public, were always a great draw and never failed to inspire, stimulate and challenge. His book Caamano in London: The Exile of a Latin American Revolutionary, about the former Dominican president’s spell in London in the 1960s, will be published later this year. The news that Syria may, or may not, have delivered SCUD missiles to Hezbollah has prompted a frenzy in the commentariat this week. Pieces have appeared in the BBC, Foreign Policy and Haaretz all speculating what this might mean. Whilst the implications of this development deserve analysis in their own right, i’d like to draw attention to the central role of Andrew Tabler: ‘Syria Expert’ in this story. Not only did Tabler first draw attention to this story in his piece for Foreign Policy, but he then acted as ‘expert commentator’ for Haartetz, the Wall Street Journal and the BBC’s coverage of the event. Tabler, however, is no impartial view. He works for the Washington Institute for Near East Policy – one of the most pro-Israel think tanks in the US. Indeed, it was founded by members of Aipac and any quick glance over their website demonstrates that it frames all its coverage of Syria through an Israeli lens. Though Tabler can claim some expertise on Syria, he spent several years living in Syria founding Syria Today magazine, it cannot be denied that his current employers have a clear political agenda. This sudden escalation in anti-Syrian news is clearly timed to coincide with the approval of a new US ambassador to Damascus in Congress and the WINEP and Tabler have been amongst the most vocal in opposing this reengagement. I am not saying that Tabler is wrong about the SCUDS – i am not fully aware of the details on the ground and whether or not SCUDS have been delivered. However, i am frustrated that media outlets are willing to take one ‘expert’s’ word as gospel on Syria without looking at his political credentials. I am particualrly surprised at the BBC’s Kim Ghattas, who is usually genuinely balanced in her reporting. For a far more balanced response, i noticed Josh Landis has written a good reply in Foreign Policy just now. On that note, good on Foreign Policy for showing both sides! An interesting question will be what impact the run up to the 2011 election in Egypt will have on the other autocratic regimes in the region. …don’t be surprised to see subtle endorsements of Mubarak from Amman, Riyadh and the Gulf in the coming year. Maybe even from Washington and Tel Aviv. After all, who stands to lose most from a genuine democratic government in the Arab world? Kuwait has deported at least 21 followers of Egypt’s high-profile opposition figure Mohamed ElBaradei, human rights groups say. According to Human Rights Watch, Kuwait’s interior minister Sheikh Jaber al-Sabah said the Egyptians had assembled without permission and had criticised the Egyptian president. It is rare for Kuwait to deport expatriates for political activities. According to Israeli officials, he pulled out of the meeting after “learning that Egypt and Turkey may have been planning to use his appearance at the conference to call on Israel to sign the nuclear non-proliferation treaty (NPT) and to open its nuclear facilities to international inspection”. Finally, it seems, the international community – after commendable pressure from Egypt and Turkey – are beginning to link Israel’s WMD to Iran’s nuclear programme. It has long been argued by Arab leaders that a nuclear-free Middle East is the best way to dissuade Iran from pursuing the bomb. Seeing this I was reminded of an interview that Bashar al-Assad gave to the Daily Telegraph back in 2004. In it he declared that he would not get rid of Syria’s weapons of mass destruction (believed to be chemical, and possibly biological weapons) unless Israel does the same. It seems that Assad could now steal a diplomatic coup if he once again raises this issue: publically offering to destroy Syria’s stockpile if Israel agrees to denuclearise. There are several advantages to this. Firstly it would give Syria the moral high ground in its war of words with Israel, highlighting the West’s double-standard to WMD in the Middle East, and putting even more pressure on Israel. Secondly it could strengthen relations with the US given Obama and Clintons’ recent advocacy of nuclear disarmament. Thirdly, as ever, it would draw attention to the often neglected issue of the Syrian-Israeli conflict. Finally, it would show support to the proposals of Syria’s ally Turkey and help the process of mending fences with the other advocate of the motion, Egypt. For a country that takes great care to promote a positive image abroad, Jordan has recently been subjected to unusually harsh criticism from Western NGOs. In February, Human Rights Watch accused Amman of arbitrarily withdrawing citizenship from several thousand of its citizens of Palestinian origin, “denying them basic citizenship rights such as access to education and health care.” Similarly, the previous month Freedom House, the Washington-based democracy watchdog, relegated the Hashemite Kingdom from the tiny list of ‘partly free’ Arab governments to the ever-increasing collection of ‘not free’ states in the Middle East. The two complaints are not unrelated. 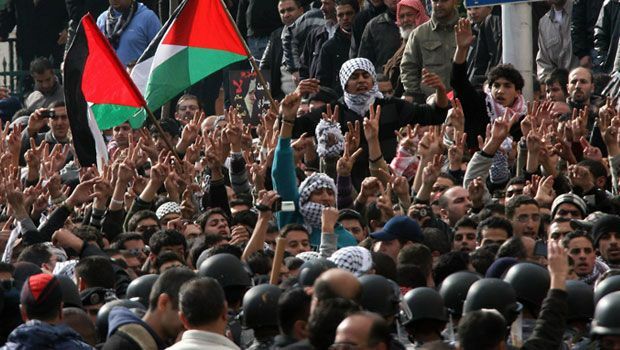 The failure of Jordanian democratizing initiatives has much to do with government fears that genuine freedom will allow its Palestinian-originating majority to dominate over the East Bank elite who have ruled in Amman since independence. The practice of withdrawing citizenship from a select few stems from the same concerns. Though over half of Jordan’s population are of Palestinian origin, many are economically and politically disenfranchised and social divisions remain acute. Despite sixty years of attempted integration, the Hashemite monarchy has still not come to terms with its ‘Palestinian problem’. The Hashemites’ fear of its Palestinian population has deep roots. Forty years after Jordan lost the West Bank to Israel, and sixty years since the first Arab-Israeli war, descendents of refugees from both conflicts remain in breeze block refugee camps scattered around Jordan, alongside a further 300,000 that were expelled from Kuwait during the 1990-91 Gulf Crisis. According to the United Nations Relief and Works Agency (UNRWA) that operate these camps, in 2003 1.7 million of Jordan’s 6.3 million population were registered refugees. It was from these camps that Yasser Arafat’s PLO drew support in the late 1960s until they were crushed by King Hussein’s forces in the 1970 Black September civil war amidst fears that Arafat sought to replace the Hashemite monarchy with a revolutionary Palestinian state. Though Arafat was exiled to Lebanon, the idea of a Palestinian government in Jordan was revived by the unlikely source of Israel’s Likud Party in the 1980s and 90s which sought to legitimize their annexation of the West Bank with the slogan, “Jordan is Palestine.” Despite Hussein signing a peace with Tel Aviv in 1994 and renouncing his own claim to the West Bank in 1988—thereby giving his support to the idea of a separate Palestinian homeland outside of Jordan—the election of Benjamin Netanyahu last year has revived Amman’s paranoia. Indeed, as Human Rights Watch reported, Jordanian officials defended the practice of withdrawing citizenship from Palestinians as a means to counter any future Israeli plans to transfer the Palestinian population of the West Bank to Jordan. Yet withdrawing citizenship from every Jordanian Palestinian to guard against right-wing Israeli rhetoric would be impossible and such recent actions must be seen more as a method of intimidating disgruntled citizens rather than a tool to actually redress Jordan’s demographic balance. This is in line with a wider practice of official and unofficial discrimination within the kingdom. On the one hand, unlike refugees in Lebanon and Syria, Jordanian Palestinians enjoy full citizenship rights entitling them to live where they like, be educated and to vote. At the same time, many Palestinians face a glass ceiling whereby the vast majority of positions in the army, civil service and government are filled by the East Bank Jordanian minority. Moreover, political discrimination is widespread. Carnegie’s Arab Reform bulletin highlights that in Jordan’s parliamentary elections, urban areas with large Palestinian populations receive the same number of MPs as rural areas with a population up to seven times smaller to ensure the dominance of East Bank Jordanians. Magnifying these divisions is Jordan’s economy. Whilst western allies have praised King Abdullah II’s market reforms since inheriting the throne in 1999, their effects have been lopsided. Fueled by foreign investment, central Amman is currently awash with cranes building new skyscrapers, banks, luxury hotels and malls—including the new $300 million Jordan Gate complex and the $370 million Abdali Central Marketplace. Yet any benefit is largely restricted to a small elite, and the United Nations Development Programme warned recently that poverty and unemployment, both currently at 13%, is likely to increase. Jordanians already speak of two Ammans: the wealthy West and the poor East. Not surprisingly, most of the inhabitants of East Amman are originally Palestinian. The division though is by no means black and white, and many among the West Amman elite are themselves of Palestinian origin. At the same time, many of the thousands of Jordanians living below the poverty line have no familial ties to Palestine. Even so, the Jordanian government is well aware of the problem of its mass of urban poor Palestinians, who resent both their economic and political disenfranchisement. This situation is only exacerbated by frustration at Jordan’s policy towards Israel and the Palestinian territories. Despite a decade and a half of peace with Tel Aviv, Jordan’s Palestinians have seen neither material benefits at home nor relief for their relatives in Palestine. Whilst paying lip service to the Palestinian cause, Abdullah II’s apparent compliance with the US and Israel on issues such as the Iraq war, the boycott of Hamas and his comparative silence during the Gaza War only serve to heighten a perceived distance from the government. Whilst Abdullah is clearly torn between the pro-Palestinian sentiment of his population and the need to toe the line of his western allies to secure aid and investment, the continued revocation of citizenship from Palestinians suggests that the latter will always outweigh the former. On the one hand, Abdullah appears keen to address the divisions in his society. Since assuming power, the King has launched three widespread campaigns to promote national unity. ‘Jordan First,’ ‘We are all Jordan,’ and ‘The National Agenda,’ were all designed to integrate the disparate elements of Jordan’s population, particularly the Palestinians, behind the state and monarchy. Yet these were not accompanied by any real effort to end political discrimination or economic imbalance, so it is not surprising that they had little impact on lessening dissent. Slogans cannot paper over the cracks of decades of division. Irrespective of developments in the West Bank, until the real problem of economic and political disenfranchisement at home is addressed, Amman is likely to continue to rely on intimidation tactics like revoking citizenship and decreasing freedoms to deal with its disgruntled Palestinians. WSJ: One factor in all of this, and no one can really see where we are headed, is Syria…How is Jordan’s relationship with Syria and how do you see that? HM: Jordan’s relationship with Syria is better than it has been in a long time; probably the best it’s ever been. … So the engagement now between the Syrian and Jordanian government on economic cooperation are at an all-time high. The Israeli-Syrian issue is obviously high on their priority list. WSJ: The message you get from Syria is they’re ready to talk? HM: Yes, they are ready to talk but again I think everyone is still trying to decide what this Israeli government is all about. The rhetoric is positive, but actions on the ground show us something completely different, so there is frustration from Syria towards Israel. This, of course, betrays the WSJ’s ignorance or, perhaps, self-delusion about Jordan’s importance. He might be the friendly face of the Arabs for the Western media, but Abdullah has no influence over Damascus alone. If anything, Damascus is enhancing its clout with Amman due to the growing reliance by Jordan on Turkish trade (and water) that comes through Syria.